Get your ducks in a row for the Buffalo Rotary Duck Derby fundraiser at Canalside. Enjoy great food trucks, cool off at the beverage tent, check out the family activities, balloons, prizes and the quaziest race ever when we “launch” hundreds of rubber ducks off the “Blue Line Bridge” at The Canals in Buffalo’s Canalside during the Buffalo Rotary DUCK DERBY fundraiser. With your $5 donation for a duck, YOU have the opportunity to cheer on your little quacker racing for the finish line AND help raise money for our community. 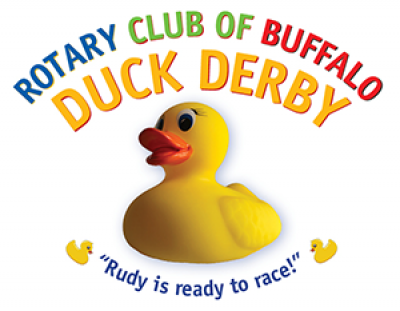 Help “Rudy” and his feathered friends raise money for The Buffalo Rotary Foundation, Inc.’s diverse community projects that make Western New York a better place to live. Your “ducky donation” will allow our club to fund projects large and small. Past grants include Rotary Rink, Frank Lloyd Wright’s Fontana Boathouse, Willie Hutch Jones Educational & Sports Programs, Literacy Volunteers, Cradle Beach, Buffalo Police Athletic Association (PAL) and many more.